Ever wonder what kind of bird is outside your window singing its sweet songs? 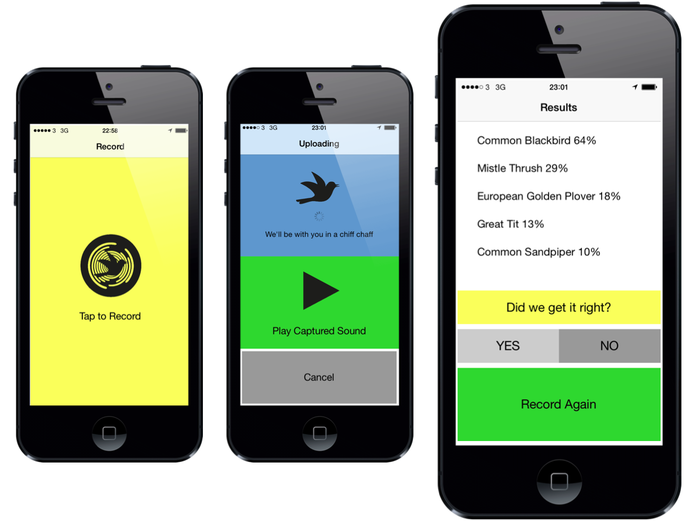 A new Kickstarter is seeking to raise £50,000 for an app that can identify a bird by listening to its chirps. The idea behind Warblr is simple: Like Shazam, it allows you to record a clip of a bird singing, then the app compares it to a database and returns what it believes is the most likely match. According to the Kickstarter, the app has a 95 percent accuracy rate under optimum conditions. Currently, the app can identify 80 British birds. Of course, conditions are rarely optimal. If there’s one bird in the area, there’s likely another, and sometimes the two songs can get mixed up. Making things more complicated is the fact that no two bird calls are identical, even if they’re from the same bird — they sound slightly different each time. Some birds learn new and different songs throughout their lives. And individual birds from the same species may sound different from each other. The tech behind Warblr is not simple. It turns out identifying a natural sound like a bird’s call is much more difficult than identifying recorded music, which repeats the same pattern of notes every time. The automatic bird identification analysis feature was developed by Dan Stowell, a research fellow at the University of London Queen Mary. First, he put together a large dataset of over 100,000 bird recordings from the British Library Sound Archive and other sources. But you’re not going to find one-to-one matches from a natural birdcall and the database. Stowell’s research is centered around applying various machine learning methods to sound. His most recent work involves unsupervised feature learning, which is one of the keys to Warblr’s bird identification algorithm. More information, as well as a list of Stowell’s publications, is available on his university page. Eventually, Stowell wants to work on techniques that can identify when and how birds are talking to each other. Unfortunately, Warblr is U.K.-only, so it won’t work for identifying most songbirds here in the United States. Stowell and Florence Wilkinson, the people behind the Kickstarter, want to make a U.S. version after they work out the kinks and add user interface touches like images of birds and other relevant information. Of course, that would require a new United States-oriented dataset as well as training the algorithm to properly identify Yankee birds. The app is far enough along — they’ve got a prototype at the moment — that you’d assume there would be a public launch of sorts even if the Kickstarter isn’t funded, but the money from a successful Kickstarter would certainly accelerate the process of the app being adapted and polished for the United States as well as for end users in the UK. Unlike many Kickstarters, this one doesn’t appear to be the start of a billion-dollar business, and it even has conservation goals — it will correlate bird identification with users’ GPS locations, and make that data available to ecologists and zoologists for projects like studying migration. Warblr is expected to launch in spring 2015 for both iOS and Android devices, and it will cost £1.99. Mockingbirds mimic other birds. Then there’s the lyrebird. It is known to mimic cameras, chainsaws, car alarms, etc. Good luck! When I lived in San Francisco, we had a mockingbird in our neighborhood that imitated a car alarm. Good question… You tell me, I’m trying to identify the bird because I DON’T know what it is! Florence â€“ Warblr co-founder here! Thanks for your comment. The “Did we get it right?” button is just for the prototype whilst we’re improving our technology.